Bitcoin has a fuzzy history, but it’s a type of currency that allows people to buy goods and services and exchange money without involving banks, credit card issuers or other third parties. Here’s something I’ve been learning. If something innocuous comes out of nowhere and all-of-a-sudden is covered by the mainstream Fake News media as though it is the apocalypse… it’s all planned and done for a reason. Is that really the case? How did they know so quickly? The entire ransom collected so far, mostly from idiots and moronic government agencies who still use Windows XP and don’t update their software, is a total of $70,000. Is this really the worst attack of all time? The attack gained worldwide attention 11 days after May day. May day, or May 1st, is the anniversary of the Bavarian Illuminati which was formed on May 1, 1776. Or, 1/5/1776. Which, when added up, 1+5+17+76 equals 99. Within minutes, the media seemed to already know how many countries were hit by the attack. The number? 99. “Wannacry” in gematria, which the globalists use, is the number 99 in “English ordinal” and has all 9’s along the bottom row. So, this already seems to have all the markings of a globalist hoax or false flag.But, where did this virus come from? Surprise, surprise, it came from the National Security Agency (NSA). The virus is called EternalBlue and is an exploit generally believed to have been developed by the NSA. So, what we have here is a virus developed by the US government which apparently set off the “worst cyberattack of all time” which affected 99 countries, and only received ransoms of $70,000 but was portrayed as an event of grave international importance. If this was a false flag, what was the goal/target? Well, here’s the thing. The ransom was collected in bitcoin! And, voila, bitcoin is demonized yet again. As though no ransom in history was ever collected in dollars. Within hours of the news, bitcoin dropped 13.81% as the mainstream media declared that bitcoin is responsible for this government created virus run amok! These attacks by governments, central banks and the mainstream media have less and less effect each time, however. And no wonder, according to this site, bitcoin has now been declared dead by the mainstream media 129 times.This time, it only took bitcoin a day to recover its losses. And, just as we have been saying it would for years, the entire cryptocurrency space has been skyrocketing. In just the last two weeks, the total market capitalization of all known cryptocurrencies has nearly doubled. On April 30th the total market capitalization of all cryptocurrencies totaled $36 billion. Today it stands at over $60 billion!Subscribers to TDV have been making fortunes. We have been covering and recommending bitcoin since $3 in 2011 for a 60,233% gain so far. Not bad! The first altcoin we recommended was Ethereum on January 27th, 2016 at $2.29 and it is currently trading at $90 for a 3,830% gain. Also not too shabby! We then recommended Monero on August 18th, 2016 at $2.21. Monero is currently trading at $28 for a 1,166% gain! We began recommending to use Steemit.com about 9 months ago but never recommended actually purchasing the cryptocurrency that backs the social networking platform until it was at $0.16 on March 29th, 2017. Steem is currently trading at $0.90 for a 462% gain. And, our latest big win was Dash, which we recommended on February 14th at $17.15. It is currently trading at $83 for a 386% gain. We’re just about to release the May issue of The Dollar Vigilante where we unveil our latest cryptocurrency pick. You can get access to that by clicking here. 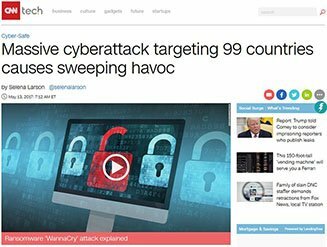 In a few days, this WannaCry ransomware attack will be completely forgotten by the fluoridated masses as will the globalist’s latest attempt to try to slow down bitcoin and the entire cryptocurrency space. They can’t stop it and don’t even know what to do to try… and their attempts get more and more laughable each time. Soon, at the rate the cryptocurrency space is growing, central banks and big government will be washed away like the bad dream they were for humanity for the last few centuries. After bitcoin gets done with the central banks and governments, the globalists are going to be the ones who WannaCry.